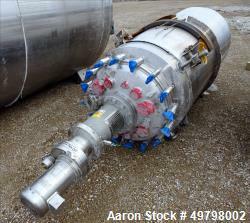 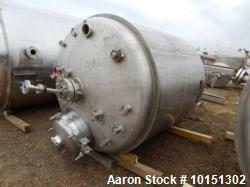 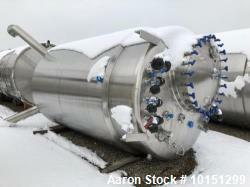 Unused-Used: Reactor/fermenter designed by Four Corporation in 1990. 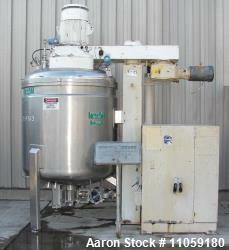 Vessel MAWP rated for FV/50 psi @ 32 to 300 deg F internal. 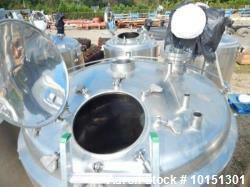 Jacket MAWP rated for 150 psi @ 32 to 300 deg F. 304 stainless steel 1/2 pipe coil design. 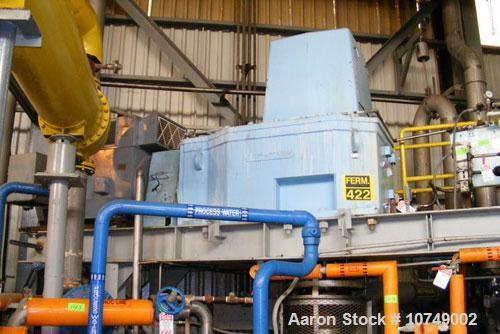 Bridge mounted agitator manufactured by Lightnin, model 883-SS-500, 17.5:1 ratio, direct coupled to a dual speed Siemens/Allis DC motor, 500/250 hp, 64.4/42.1 amps, 4000 volts, frame 5011US, 1782/887 rpm output. 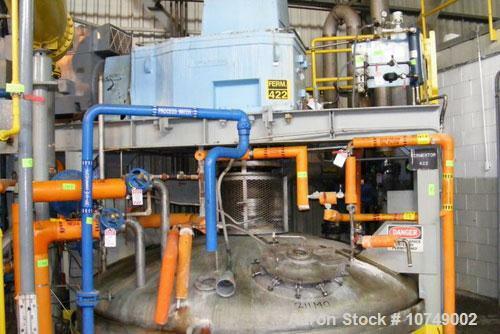 Motor starter is AB/Rockwell with Cline multi-relay, mechanical seal on shaft, agitator has three sets of 5 blade turbines. 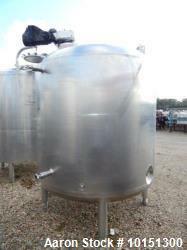 (4) Baffles bolted on side wall and internal inspection ladder. 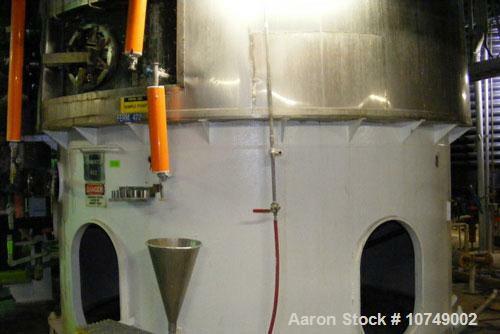 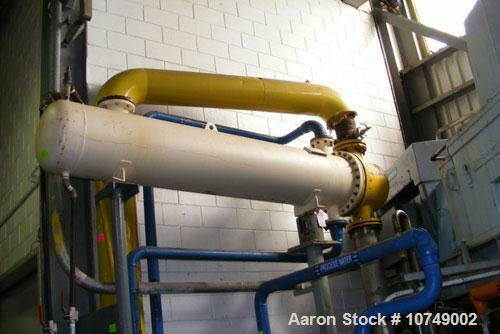 Openings include: top (1) 20" manway with 6" sightglass in hinged cover, (1) 8" flanged nozzle, (1) 2" flanged nozzle, (2) 3" nozzles without flanges and (5) 1" couplings; side (1) 20" x 16" elliptical manway near bottom with cover; bottom (1) 4" outlet; jacket has (10) 4" flanged inlets and outlets. 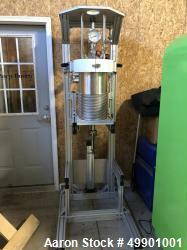 Mounted on 5'8" high carbon steel skirt. 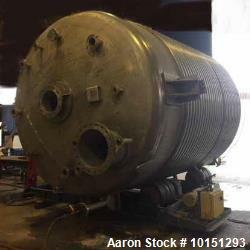 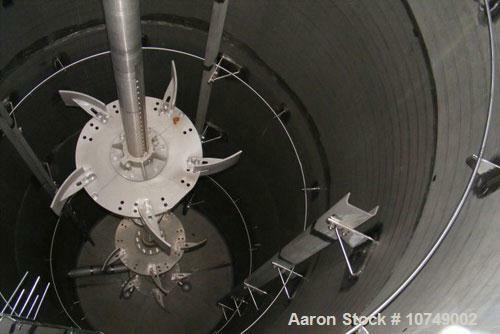 Includes a horizontal carbon steel shell/CU-NI tube U-tube air cooler manufactured by Alonso and Carus, rated 75 psi @ 200 deg F, and approximate 100 gallon stainless steel separator tank..